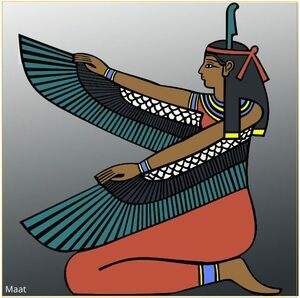 Maat (also known as Ma'at, Mayet or Maae't) is the Egyptian Goddess symbolizing cosmic order, truth, justice, morality, harmony, stability and balance. Depicted as a woman wearing an ostrich feather on the head, and holding an ankh in one hand and a scepter in the other, the Goddess is said to be the daughter of Sun God, Ra and the consort of the Moon God, Thoth. Maat was revered even by the Gods. The Goddess is symbolically represented by an Ostrich Feather. It is a strong Egyptian belief that after death, the dead are judged in the Hall of Maat, where their conscience (heart) is weighed against the feather. A heart heavier than the feather denoted a life of wicked deeds and such a soul would be devoured by Goddess Ammit, while balanced scales indicated an honorable life and such a soul would be welcomed by God Osiris. Virgin Islanders have not thoroughly exercised their rights as stipulated by the “Treaties & Resolutions” to accomplishing Self-Determination/Decolonization. Reparations are an important path on this journey to Self-Determination of the Virgin Islands which includes our history prior to the Transfer of 1917. Our Reparations movement has been started by ACRRA and will continue by participating in dialogue with Virgin Islanders and others in the Diaspora. Your comments may be submitted to info@aphj2sd.com. The Caribbean Community (CARICOM) is a grouping of twenty countries: fifteen Member States and five Associate Members. It is home to approximately sixteen million citizens, 60% of whom are under the age of 30, and from the main ethnic groups of Indigenous Peoples, Africans, Indians, Europeans, Chinese and Portuguese. The Community is multi-lingual; with English as the major language complemented by French and Dutch and variations of these, as well as African and Indian expressions. Amidst this phenomenon African Americans have renewed their call for reparations for the legally sanctioned harms of slavery and Jim Crow oppression. These renewed claims have gained momentum, per-haps more so than at any time since Reconstruction-when Congress and the President sought to confiscate Southern land and provide freed slaves with forty acres and a mule.' The Florida legislature recently approved reparations for survivors and descendants of the 1923 Rosewood massacre." “On Sept. 20, 1945, three months after the end of World War II, Chaim Weizmann, on behalf of the Jewish Agency, submitted to the governments of the US, USSR, UK, and France, a memorandum demanding reparations, restitution, and indemnification due to the Jewish people from Germany for its involvement in the Holocaust. He appealed to the Allied Powers to include this claim in their own negotiations for reparations with Germany, in view of the "mass murder, the human suffering, the annihilation of spiritual, intellectual, and creative forces, which are without parallel in the history of mankind."